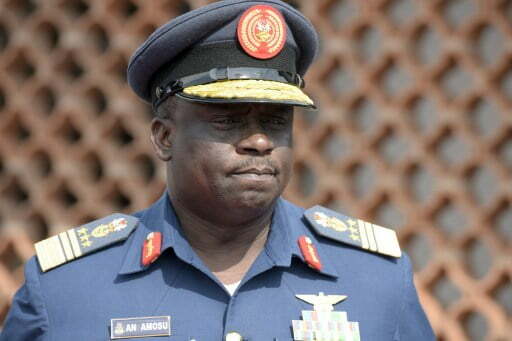 Former Chief of Air Staff, Air Marshall Adesola Amosu, and 10 others who are being tried for an alleged N22.8 billion fraud yesterday pleaded with a Federal High Court in Lagos to allow them enter into a plea bargain arrangement with the federal government. The EFCC accused them of conspiracy, stealing, money laundering, concealing of proceeds of crime and conversion of funds belonging to the Nigerian Airforce to their personal use around March 5, 2014 in Lagos. However, the defendants had pleaded not guilty to the charges, a development which made the trial judge, Justice Mohammed Idris to grant Amosun, Adigun and Olugbenga bail in the sum of N500m each with two sureties in like sum. At the resumed hearing of the case on Monday, counsel to the EFCC, Nnaemeka Omewa informed Justice Idris that the defence team are currently in talk on the possibility of settling the matter out of court. Responding, Amosu’s lawyer, Chief Bolaji Ayorinde (SAN) while confirming the submissions of the EFCC’s lawyer, sought for an adjournment to allow parties conclude with discussions. After listening to the lawyers, Justice Idris adjourned the matter to March 7 for report of settlement or continuation of trial. Amosu, was arraigned on June 29, 2016 by the Economic and Financial Crimes Commission (EFCC) alongside two senior serving Air Force officers, Air Vice Marshal Jacob Bola Adigun and Air Commodore Gbadebo Owodunni Olugbenga and seven companies before Justice Mohammed Idris.